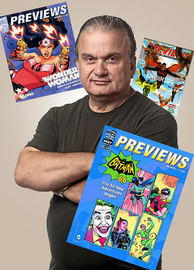 In in 1972 when he was in his early 20s, Geppi rediscovered his love of comics when he found his nephew reading an old Batman comic. He bought some second hand comics from a woman his mail delivery route, then began hitting flea markets and comic shows looking to trade. Those trades eventually became sales, and he quit his regular job as a mailman to focus on attending more comics shows. in 1974 he opened his first comic book store, although he realized there was even more money to be made as the middle man who distributes the product to others. He eventually bought New Media/Irjax, a once large but then struggling distributor and created Diamond Comic Distribution.